Every facet of production is scrutinized and controlled through detailed testing and continual quality checks performed by a proficient technical staff. The founders of the corporation, together with their staff and technicians, bring with them decades of experience resulting in skills that cover the broad range of manufacturing aspects needed to meet customer demands. All optical components are custom manufactured according to customer's drawings and specifications. There is no standard product line. Our most valuable asset is our skilled technical staff. Modern equipment supplements human skill with increased productivity and consistency. 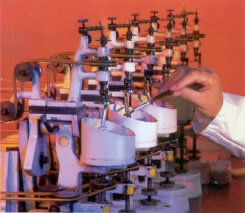 Proven production methods combined with skills guarantee repeated quality output.